As the UK terror threat level is raised to its highest level, we ask what does that mean? Police have arrested a man in the Moss Side area of Manchester in connection with Monday's attack. Eight men remain in custody as part of the investigation, Greater Manchester Police say. The Question Time debate turns to the leaking of details of the Manchester investigation - including photos from the scene - to the US media. Amber Rudd says Theresa May has raised the matter with US President Donald Trump, and that she does not think the leaks have damaged the investigation. The home secretary, who has previously expressed her irritation at the reports appearing in the US media, adds: "It must have been such a terrible thing for the families to see." 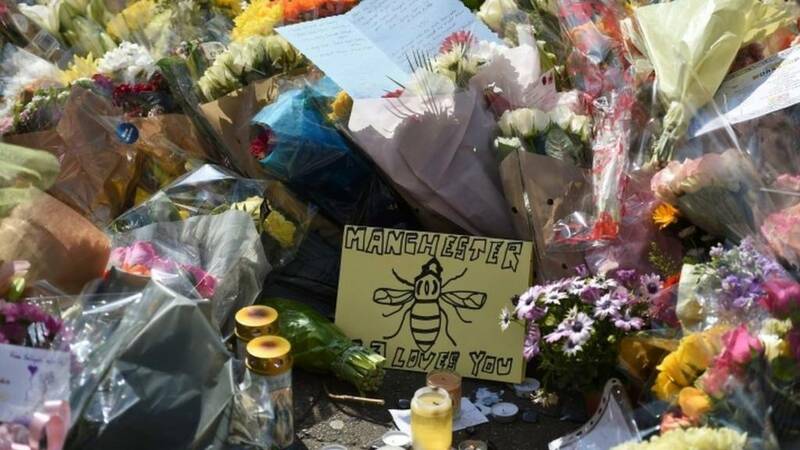 Labour's Greater Manchester Mayor Andy Burnham says what has happened is "absolutely outrageous". "It's wrong, it's arrogant of the Americans and it's disrespectful to the people of Greater Manchester and most importantly the families of those who have died." "I'm a proud Manc and a proud Muslim", says a man in the Question Time audience. "What happened on Monday night was an evil act and abhorrent act," he says. He warns that Muslims can be "collateral" damage after a terror attack if Islamophobia increases. Let's not be divided, he says. 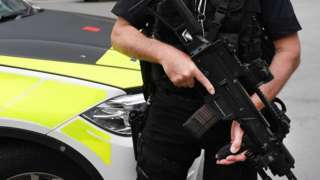 The home secretary rejects criticism of cuts to police budgets, which some warn have affected on-the-ground intelligence about possible extremism. "We must not imply that this terrorist activity would not have taken place if there were more police," she says, on Question Time. Good counter-terrorism policy relies on strong relationships between the police and the intelligence services, she says: "It's not about those pure numbers on the street." She adds: "It's not about policing, so much as engaging with community leaders in the area." Greater Manchester Mayor Andy Burnham says the prime minister and home secretary have taken decisive action and should be commended. He goes on to praise the reaction of the city in coming together and the response of the emergency services, following Monday's attack. "This is the greatest city in the world and I couldn't be more proud of it," he adds. Question Time is up and running in Salford, Greater Manchester. A man in the audience says, as a father of two young girls, he finds it hard coming to terms with the Manchester suicide bomb attack. Amber Rudd says she does too, and that the important thing is to let the investigation take place. Nazir Afzal, the chairman of the Police and Crime Commissioners Association, says a conversation is also needed about "deradicalisation" and engaging communities. Gabriel Gatehouse tells the BBC's Newsnight that Manchester Arena bomber Salman Abedi and his father, who has been detained by militia in Libya, fought against Colonel Gaddafi as part of a campaign to topple his regime. As campaigning for the general election resumes on Friday, the leader of the Labour Party will give a speech criticising cuts to police forces. The mother of three daughters who went to the Ariana Grande concert in Manchester on Monday night tells BBC's Newsnight how grateful she is that they came home alive. Watch the full interview on BBC Two tonight.